The Seaton Tramway is a 2 ft 9 in (838 mm) narrow gauge electric tramway which operates over part of the route of a former London & South Western Railway branch line to Seaton, Devon. The line was established in 1970 by Claude Lane, who had bought the line from British Rail and had successfully operated trams in Eastbourne as a visitor attraction between 1953 and 1969. The 3-mile (4.8 km) route runs through East Devon's Axe Valley, between the coastal resort of Seaton (Seaton Terminus), the small village of Colyford, and the ancient town of Colyton. Fourteen tram cars are part of the visitor attraction, which sees about 80,000 visitors per year. All of the tramcars are based on classic British tram designs, and vary in size between half-scale (1:2) and two thirds-scale (2:3). Most were built from scratch by Claude Lane and/or his successor Allan Gardner, but three were rebuilt from full-size cars which originally ran in London, Bournemouth and Exeter (Car 19 is the only surviving car from the Exeter tram system). 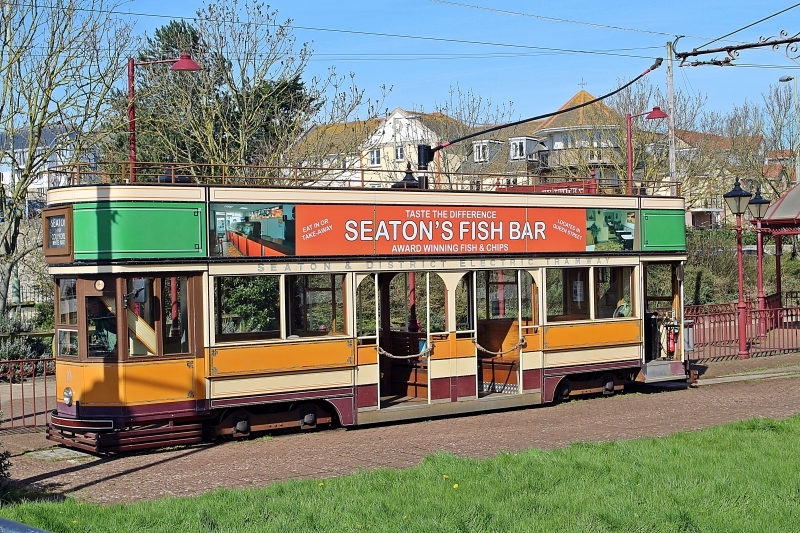 Please give us your overall rating for Seaton Tramway.